Would you kill to write a bestseller? Well Adrian Slater says that he’s prepared to do just that, and announces the fact in a creative writing class. Lecturer Dudley Grose is convinced that Slater is a psychopath and means what he says. But the Dean of the university doesn’t believe him and neither do the cops. But when a student on the course vanishes and her bathroom is awash with blood, the police wonder if Slater has actually carried out his threat, and if the book he’s writing contains the evidence that will put him away. The Bestseller is a book about murder, but it’s also an insight into the creative writing process and how ePublishing has changed the rules for ever, creating a world where murder as entertainment might actually pay. The Bestseller is a fast-paced novella of 53,000 words, about 200 pages, with a shocking twist in the tail. Stephen Leather has come up with another engrossing thriller that at around 53,000 words provides an absorbing journey to an unexpected destination. Readers may think they have worked out the ending before reaching the climax but as they read on, the story takes a final twist - but you'll have to read the story to find out what happens! If you are expecting the kind of story you would get from Stephens other books like Hard Landing and characters like Spider Shepard you will be sorely disappointed. This is a whole new Leather. This is a book with many levels, a psychological thriller, a look inside the writers world from the point of view of the protagonist Dudley Grose the flawed writer and college teacher and his constant battle against new technology, Kindle etc. The antagonist is a pure Socio path who hides a blade behind a smile. From the start the sense of menace is set with a night time scene in a marina with lightning flashes and the girl looking for evidence being cornered by the bad guy. It does burn along slowly but the tension builds to a big twist at the end, two twists in fact which I will not spoil by revealing them here. It does seem as if Stephen is experimenting with different genres and thats good, keeps things fresh and his fans on their toes. The book is well worth checking out, the dialogue is realistic and the pace flows along well but do not take my word for it check it out for yourself. 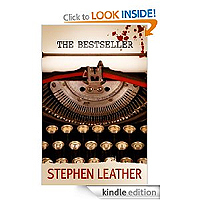 This is the first Stephan Leather book that I have read and I have to say I really enjoyed it. After the first few pages I was eager to read more and before I knew it 50 pages were read. Interesting concept and story line, something quite fresh to me to read as I usually go for Sci Fi books. However this book may just have made me take a further interest in thriller. The ending was a little weak , but none the less did not detract away from the story. Great value for money also !.